IHG has InterContinental Weekend Escapes rates for stays at participating hotels in Europe that requires Friday or Saturday nights stay. The rate is discounted by minimum of 10% and includes a breakfast for two. This offer is valid for stays until January 5, 2014. Note that if you click through the link on the promotion page, it only will show you the “Weekend Escape” rates and nothing else. You need to have another browser tab open to see all the rates offered by the property. 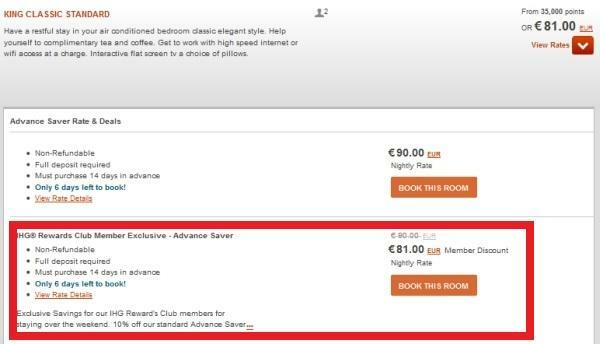 The regular rate search returns a rate of 81 euros for a Saturday night. The Weekend Escapes rate is 24 euros higher. As is always the case with hotels promotional rates, you absolutely must check all the rates to find the lowest price. Don’t assume that this “Weekend Escape” or any other rate that you are emailed about is necessarily the lowest. The ‘Weekend Escapes’ offer is only applicable (subject to availability) at participating InterContinental® Hotels & Resorts in Europe. Stays have to include a Friday or Saturday night. From rates listed are a predicted average for standard rooms for the stay period between October 18, 2013 until January 5, 2014 and will be available for a minimum of 10% of standard room bookings per hotel during this period. The listed rates are based on two adults sharing a standard twin/double room and include breakfast for two at the main restaurant on each day of the stay. The rate discount of the offer is calculated as a percentage off each night of stay and will be at least 10% off the Best Flexible Rate including breakfast at the participating hotel. The discounted rate will be confirmed at the time of booking. For the avoidance of doubt, no discount will apply to other hotel charges including, but not limited to, room service, food and beverage, gratuities and incidentals and all such charges must be paid to the participating hotel in full by the guest at check out. Any unused components of an offer (including breakfast) are non-refundable and cannot be redeemed in cash. Bookings must be made a minimum of 5 days in advance of stay and full prepayment for the entire stay is required at time of booking which is non-refundable, except where prohibited by local laws. The payment card will be charged between time of booking and check in. United States and Canada: 1 800 424 6835, Japan 0120 455 655, Middle East and Africa +971 44 29 05 28). The Offer is subject to availability, valid on new bookings only, not applicable to groups and cannot be used in conjunction with any other offers or special promotions. Blackout dates (days when the Offer is not available) may apply.